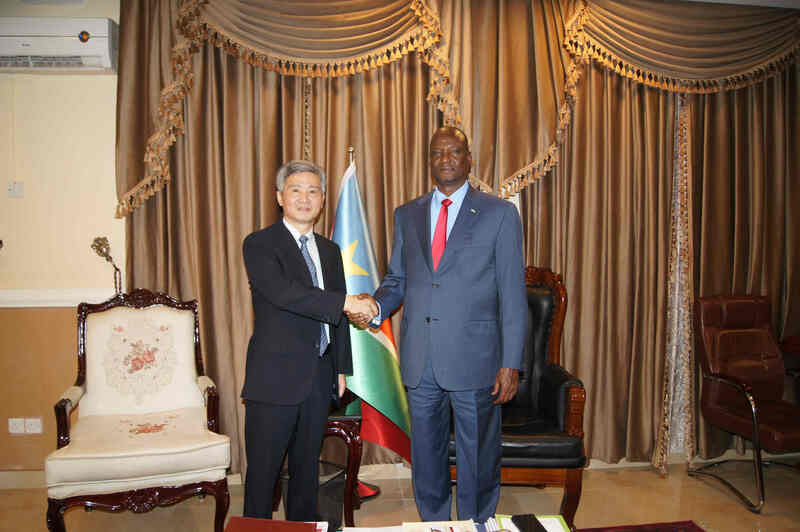 On March 6, 2019, Chinese Ambassador to South Sudan H.E. He Xiangdong bids farewell to H.E. Gen. Taban Deng Gai, First Vice President of the Republic of South Sudan. Ambassador He expressed his sincere appreciation to FVP Taban Deng for helping him fulfill his tasks in South Sudan. Ambassador He said that last year President Xi Jinping and President Salva Kiir had a fruitful meeting on the sideline of FOCAC Beijing Summit, in which they laid out a grand blueprint for China-South Sudan relations. China will work closely with South Sudan to implement the outcome of FOCAC Beijing Summit and consensus reached by both heads of state, further deepening cooperation in various fields and strengthening bilateral relations. FVP Taban Deng wished the ambassador success in his future endeavors and thanked Ambassador He for his contributions in promoting bilateral relations. FVP Taban Deng emphasized that South Sudan sees China as a reliable partner and good brother. South Sudan is willing to strengthen cooperation in infrastructure and all other fields with China, further promoting bilateral relations between the two countries.